Not to be confused with Concentrated solar power. This Amonix system in Las Vegas, USA consists of thousands of small Fresnel lenses, each focusing sunlight to ~500X higher intensity onto a tiny, high-efficiency multi-junction solar cell. A Tesla Roadster is parked beneath for scale. Concentrator photovoltaics (CPV) (also known as concentration photovoltaics) is a photovoltaic technology that generates electricity from sunlight. Unlike conventional photovoltaic systems, it uses lenses or curved mirrors to focus sunlight onto small, highly efficient, multi-junction (MJ) solar cells. In addition, CPV systems often use solar trackers and sometimes a cooling system to further increase their efficiency. :30 Ongoing research and development is rapidly improving their competitiveness in the utility-scale segment and in areas of high insolation. HCPV directly competes with concentrated solar power (CSP) as both technologies are suited best for areas with high direct normal irradiance, which are also known as the Sun Belt region in the United States and the Golden Banana in Southern Europe. :26 CPV and CSP are often confused with one another, despite being intrinsically different technologies from the start: CPV uses the photovoltaic effect to directly generate electricity from sunlight, while CSP – often called concentrated solar thermal – uses the heat from the sun's radiation in order to make steam to drive a turbine, that then produces electricity using a generator. As of 2012[update], CSP is still more common than CPV. Research into concentrator photovoltaics has taken place since the mid 1970s, initially spurred on by the energy shock from a mideast oil embargo. Sandia National Laboratories in Albuquerque, New Mexico was the site for most of the early work, with the first modern-like photovoltaic concentrating system produced there late in the decade. Their first system was a linear-trough concentrator system that used a point focus acrylic Fresnel lens focusing on water-cooled silicon cells and two axis tracking. Cell cooling with a passive heat sink and use of silicone-on-glass Fresnel lenses was demonstrated in 1979 by the Ramón Areces Project at the Institute of Solar Energy of the Technical University of Madrid. The 350 kW SOLERAS project in Saudi Arabia—the largest until many years later—was constructed by Sandia/Martin Marietta in 1981. Research and development continued through the 1980s and 1990s without significant industry interest. Improvements in cell efficiency were soon recognized as essential to making the technology economical. However the improvements to Si-based cell technologies used by both concentrators and flat PV failed to favor the system-level economics of CPV. The introduction of III-V Multi-junction solar cells starting in the early 2000s has since provided a clear differentiator. MJ cell efficiencies have improved from 34% (3-junctions) to 46% (4-junctions) at research-scale production levels. :14 A substantial number of multi-MW CPV projects have also been commissioned worldwide since 2010. Modern CPV systems operate most efficiently in highly concentrated sunlight (i.e. concentration levels equivalent to hundreds of suns), as long as the solar cell is kept cool through the use of heat sinks. Diffuse light, which occurs in cloudy and overcast conditions, cannot be highly concentrated using conventional optical components only (i.e. macroscopic lenses and mirrors). Filtered light, which occurs in hazy or polluted conditions, has spectral variations which produce mismatches between the electrical currents generated within the series-connected junctions of spectrally "tuned" multi-junction (MJ) photovoltaic cells. These CPV features lead to rapid decreases in power output when atmospheric conditions are less than ideal. To produce equal or greater energy per rated watt than conventional PV systems, CPV systems must be located in areas that receive plentiful direct sunlight. This is typically specified as average DNI greater than 5.5-6 kWh/m2/day or 2000kWh/m2/yr. Otherwise, evaluations of annualized DNI vs. GNI/GHI irradiance data have concluded that conventional PV should still perform better over time than presently available CPV technology in most regions of the world (see for example ). High efficiencies under direct normal irradiance HCPV cannot utilize diffuse radiation. LCPV can only utilize a fraction of diffuse radiation. Low cost per watt of manufacturing capital Power output of MJ solar cells is more sensitive to shifts in radiation spectra caused by changing atmospheric conditions. Low temperature coefficients Tracking with sufficient accuracy and reliability is required. Source: Current Status of CPV report, January 2015.:8 Table 2: Analysis of the strengths and weaknesses of CPV. CPV research and development has been pursued in over 20 countries for more than a decade. The annual CPV-x conference series has served as a primary networking and exchange forum between university, government lab, and industry participants. Government agencies have also continued to encourage a number of specific technology thrusts. ARPA-E announced a first round of R&D funding in late 2015 for the MOSAIC Program (Microscale Optimized Solar-cell Arrays with Integrated Concentration) to further combat the location and expense challenges of existing CPV technology. As stated in the program description: "MOSAIC projects are grouped into three categories: complete systems that cost effectively integrate micro-CPV for regions such as sunny areas of the U.S. southwest that have high Direct Normal Incident (DNI) solar radiation; complete systems that apply to regions, such as areas of the U.S. Northeast and Midwest, that have low DNI solar radiation or high diffuse solar radiation; and concepts that seek partial solutions to technology challenges." In Europe the CPVMATCH Program (Concentrating PhotoVoltaic Modules using Advanced Technologies and Cells for Highest efficiencies) aims "to bring practical performance of HCPV modules closer to theoretical limits". Efficiency goals achievable by 2019 are identified as 48% for cells and 40% for modules at >800x concentration. A 41.4% module efficiency was announced at the end of 2018. The Australian Renewable Energy Agency (ARENA) extended its support in 2017 for further commercialization of the HCPV technology developed by Raygen. Their 250kW dense array receivers are the most powerful CPV receivers thus far created, with demonstrated PV efficiency of 40.4% and include usable heat co-generation. Reported records of solar cell efficiency since 1975. As of December 2014, best lab cell efficiency reached 46% (for ⊡ multi-junction concentrator, 4+ junctions). According to theory, semiconductor properties allow solar cells to operate more efficiently in concentrated light than they do under a nominal level of solar irradiance. This is because, along with a proportional increase in the generated current, there also occurs a logarithmic enhancement in operating voltage, in response to the higher illumination. Note that the unitless fill factor for a "high quality" solar cell typically ranges 0.75-0.9 and can, in practice, depend primarily on the equivalent shunt and series resistances for the particular cell construction. For concentrator applications, FF and FFχ should then have similar values that are both near unity, corresponding to high shunt resistance and very low series resistance (<1 milliohm). where the term kT/q is the voltage (called the thermal voltage) of a thermalized population of electrons - such as that flowing through a solar cell's p-n junction - and has a value of about 6998258500000000000♠25.85 mV at room temperature (7002300000000000000♠300 K). The efficiency enhancement of ηχ relative to η is listed in the following table for a set of typical open-circuit voltages that roughly represent different cell technologies. The table shows that the enhancement can be as much as 20-30% at χ = 1000 concentration. The calculation assumes FFχ/FF=1; an assumption which is clarified in the following discussion. In practice, the higher current densities and temperatures which arise under sunlight concentration may be challenging to prevent from degrading the cell's I-V properties or, worse, causing permanent physical damage. Such effects can reduce the ratio FFχ/FF by an even larger percentage below unity than the tabulated values shown above. To prevent irreversible damage, the rise in cell operating temperature under concentration must be controlled with the use of a suitable heat sink. Additionally, the cell design itself must incorporate features that reduce recombination and the contact, electrode, and busbar resistances to levels that accommodate the target concentration and resulting current density. These features include thin, low-defect semiconductor layers; thick, low-resistivity electrode & busbar materials; and small (typically <1cm2) cell sizes. Including such features, the best thin film multi-junction photovoltaic cells developed for terrestrial CPV applications achieve reliable operation at concentrations as high as 500-1000 suns (i.e. irradiances of 50-100 Watts/cm2). As of year 2014, their efficiencies are upwards of 44% (three junctions), with the potential to approach 50% (four or more junctions) in the coming years . The theoretical limiting efficiency under concentration approaches 65% for 5 junctions, which is a likely practical maximum. All CPV systems have a solar cell and a concentrating optic. Optical sunlight concentrators for CPV introduce a very specific design problem, with features that make them different from most other optical designs. They have to be efficient, suitable for mass production, capable of high concentration, insensitive to manufacturing and mounting inaccuracies, and capable of providing uniform illumination of the cell. All these reasons make nonimaging optics the most suitable for CPV. For very low concentrations, the wide acceptance angles of nonimaging optics avoid the need for active solar tracking. For medium and high concentrations, a wide acceptance angle can be seen as a measure of how tolerant the optic is to imperfections in the whole system. It is vital to start with a wide acceptance angle since it must be able to accommodate tracking errors, movements of the system due to wind, imperfectly manufactured optics, imperfectly assembled components, finite stiffness of the supporting structure or its deformation due to aging, among other factors. All of these reduce the initial acceptance angle and, after they are all factored in, the system must still be able to capture the finite angular aperture of sunlight. CPV systems are categorized according to the amount of their solar concentration, measured in "suns" (the square of the magnification). Low-concentration systems often have a simple booster reflector, which can increase solar electric output by over 30% from that of non-concentrator PV systems. Experimental results from such LCPV systems in Canada resulted in energy gains over 40% for prismatic glass and 45% for traditional crystalline silicon PV modules. From concentrations of 100 to 300 suns, the CPV systems require two-axis solar tracking and cooling (whether passive or active), which makes them more complex. High concentration photovoltaics (HCPV) systems employ concentrating optics consisting of dish reflectors or fresnel lenses that concentrate sunlight to intensities of 1,000 suns or more. The solar cells require high-capacity heat sinks to prevent thermal destruction and to manage temperature related electrical performance and life expectancy losses. To further exacerbate the concentrated cooling design, the heat sink must be passive, otherwise the power required for active cooling will reduce the overall conversion efficiency and economy. Multi-junction solar cells are currently favored over single junction cells, as they are more efficient and have a lower temperature coefficient (less loss in efficiency with an increase in temperature). The efficiency of both cell types rises with increased concentration; multi-junction efficiency rises faster. Multi-junction solar cells, originally designed for non-concentrating PV on space-based satellites, have been re-designed due to the high-current density encountered with CPV (typically 8 A/cm2 at 500 suns). Though the cost of multi-junction solar cells is roughly 100 times that of conventional silicon cells of the same area, the small cell area employed makes the relative costs of cells in each system comparable and the system economics favor the multi-junction cells. Multi-junction cell efficiency has now reached 44% in production cells. The 44% value given above is for a specific set of conditions known as "standard test conditions". These include a specific spectrum, an incident optical power of 850 W/m², and a cell temperature of 25 °C. In a concentrating system, the cell will typically operate under conditions of variable spectrum, lower optical power, and higher temperature. The optics needed to concentrate the light have limited efficiency themselves, in the range of 75–90%. Taking these factors into account, a solar module incorporating a 44% multi-junction cell might deliver a DC efficiency around 36%. Under similar conditions, a crystalline silicon module would deliver an efficiency of less than 18%. When high concentration is needed (500–1000 times), as occurs in the case of high efficiency multi-junction solar cells, it is likely that it will be crucial for commercial success at the system level to achieve such concentration with a sufficient acceptance angle. This allows tolerance in mass production of all components, relaxes the module assembling and system installation, and decreasing the cost of structural elements. Since the main goal of CPV is to make solar energy inexpensive, there can be used only a few surfaces. Decreasing the number of elements and achieving high acceptance angle, can be relaxed optical and mechanical requirements, such as accuracy of the optical surfaces profiles, the module assembling, the installation, the supporting structure, etc. To this end, improvements in sunshape modelling at the system design stage may lead to higher system efficiencies. Concentrator photovoltaics technology has established its presence in the solar industry over the last several years. The first HCPV power plant that exceeded 1 MW-level was commissioned in Spain in 2006. By the end of 2015, the number of CPV power plants (including both LCPV and HCPV) around the world accounted for a total installed capacity of 350 MW. Field data collected over six years is also starting to benchmark the prospects for long-term system reliability. 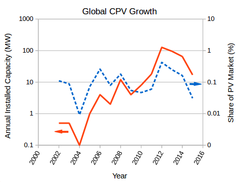 Yearly Installed CPV Capacity in MW from 2002 to 2015. Yearly Installed PV Capacity in GW from 2002 to 2015. Similar to traditional PV, the peak DC rating of a system is specified as MWp (or sometimes MWDC) under concentrator standard test conditions (CSTC) of DNI=1000 W/m², AM1.5D, & Tcell=25°C, as per the IEC 62670 standard convention. The AC production capacity is specified as MWAC under IEC 62670 concentrator standard operating conditions (CSOC) of DNI=900 W/m², AM1.5D, Tambient=20°C, & Wind speed=2m/s, and may include adjustments for inverter efficiency, higher/lower solar resource, and other facility-specific factors. The largest CPV power plant currently in operation is of 138 MWp rating located in Golmud, China, hosted by Suncore Photovoltaics. Concentrator photovoltaics and thermal (CPVT), also sometimes called combined heat and power solar (CHAPS) or hybrid thermal CPV, is a cogeneration or micro cogeneration technology used in the field of concentrator photovoltaics that produces usable heat and electricity within the same system. CPVT at high concentrations of over 100 suns (HCPVT) utilizes similar components as HCPV, including dual-axis tracking and multi-junction photovoltaic cells. A fluid actively cools the integrated thermal–photovoltaic receiver, and simultaneously transports the collected heat. Typically, one or more receivers and a heat exchanger operate within a closed thermal loop. To maintain efficient overall operation and avoid damage from thermal runaway, the demand for heat from the secondary side of the exchanger must be consistently high. Under such optimal operating conditions, collection efficiencies exceeding 70% (up to ~35% electric, ~40% thermal for HCPVT) are anticipated. Net operating efficiencies may be substantially lower depending on how well a system is engineered to match the demands of the particular thermal application. The maximum temperature of CPVT systems is typically too low (below 80-90 °C) to alone power a boiler for additional steam-based cogeneration of electricity. Such systems may be economical to power lower temperature applications having a constant high heat demand. The heat may be employed in district heating, water heating and air conditioning, desalination or process heat. For applications having lower or intermittent heat demand, a system may be augmented with a switchable heat dump to the external environment in order to maintain reliable electrical output and safeguard cell life, despite the resulting reduction in net operating efficiency. This 240 x 80 mm 1,000 suns CPV heat sink design thermal animation, was created using high resolution CFD analysis, and shows temperature contoured heat sink surface and flow trajectories as predicted. Utilization of a power purchase agreement (PPA), government assistance programs, and innovative financing schemes are also helping potential manufacturers and users to mitigate the risks of early CPVT technology adoption. CPVT equipment offerings ranging from low (LCPVT) to high (HCPVT) concentration are now being deployed by several startup ventures. As such, longer-term viability of the technical and/or business approach being pursued by any individual system provider is typically speculative. Notably, the minimum viable products of startups can vary widely in their attention to reliability engineering. Nevertheless, the following incomplete compilation is offered to assist with the identification of some early industry trends. LCPVT systems at ~14x concentration using reflective trough concentrators, and receiver pipes clad with silicon cells having dense interconnects, have been assembled by Cogenra with a claimed 75% efficiency (~15-20% electric, 60% thermal). Several such systems are in operation for more than 5 years as of 2015, and similar systems are being produced by Absolicon  and Idhelio  at 10x and 50x concentration, respectively. HCPVT offerings at over 700x concentration have more recently emerged, and may be classified into three power tiers. Third tier systems are distributed generators consisting of large arrays of ~20W single-cell receiver/collector units, similar to those previously pioneered by Amonix and SolFocus for HCPV. Second tier systems utilize localized dense-arrays of cells that produce 1-100 kW of electrical power output per receiver/generator unit. First tier systems exceed 100 kW of electrical output and are most aggressive in targeting the utility market. Several HCPVT system providers are listed in the following table. Nearly all are early demonstration systems which have been in service for under 5 years as of 2015. Collected thermal power is typically 1.5x-2x the rated electrical power. ^ 500x concentration ratio is claimed at Amonix website. ^ a b c http://www.iea.org (2014). "Technology Roadmap: Solar Photovoltaic Energy" (PDF). IEA. Archived (PDF) from the original on 7 October 2014. Retrieved 7 October 2014. ^ a b c d e f g h i Fraunhofer ISE and NREL (January 2015). "Current Status of Concentrator Photovoltaic (CPV) Technology" (PDF). Archived (PDF) from the original on 25 April 2015. Retrieved 25 April 2015. 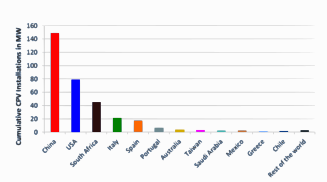 ^ "Snapshot of Global PV 1992-2013" (PDF). www.iea-pvps.org/. International Energy Agency - Photovoltaic Power Systems Programme. 2014. Archived (PDF) from the original on 5 April 2014. ^ a b c d e f "Photovoltaics Report" (PDF). 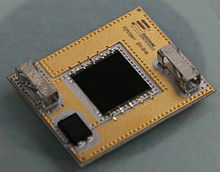 Fraunhofer ISE. 28 July 2014. Archived (PDF) from the original on 31 August 2014. Retrieved 31 August 2014. ^ Kinsey, G. S.; Bagienski, W.; Nayak, A.; Liu, M.; Gordon, R.; Garboushian, V. (2013-04-01). "Advancing Efficiency and Scale in CPV Arrays". IEEE Journal of Photovoltaics. 3 (2): 873–878. doi:10.1109/JPHOTOV.2012.2227992. ISSN 2156-3381. ^ López, Antonio Luque; Andreev, Viacheslav M. (2007). Past Experiences and New Challenges of PV Concentrators, G Sala and A Luque, Springer Series in Optical Sciences 130, 1, (2007). Springer Series in Optical Sciences. 130. doi:10.1007/978-3-540-68798-6. ISBN 978-3-540-68796-2. ^ "The Promise of Concentrators, R M Swanson, Prog. Photovolt. Res. Appl. 8, 93-111 (2000)" (PDF). ^ a b c "The CPV Consortium - Projects". ^ Fernández, Eduardo F.; Almonacid, F.; Ruiz-Arias, J.A. ; Soria-Moya, A. (August 2014). "Analysis of the spectral variations on the performance of high concentrator photovoltaic modules operating under different real climate conditions, E.F. Fernandez et.al., Solar Energy Materials & Solar Cells, 2014". Solar Energy Materials & Solar Cells. 127: 179–187. doi:10.1016/j.solmat.2014.04.026. ^ Jo, Jin Ho; Waszak, Ryan; Shawgo, Michael (2014). "Feasibility of Concentrated Photovoltaic Systems (CPV) in Various United States Geographic Locations, Jin Ho Jo et.al., Energy Technology and Policy, 2014". Energy Technology & Policy. 1 (1): 84–90. doi:10.1080/23317000.2014.971982. ^ "MOSAIC Project Descriptions" (PDF). ^ "Fraunhofer ISE Led Consortium Achieves 41.4% Module Efficiency For Concentrator Photovoltaics Using Multi-Junction Solar Cells In European Union Funded Project". 23 November 2018. Retrieved 4 February 2019. ^ "PV Education - Average Solar Radiation". Retrieved March 3, 2019. ^ "PV Education - Solar Cell Efficiency". Retrieved February 22, 2019. ^ "PV Education - Fill Factor". Retrieved March 3, 2019. ^ D. L. Pulfrey (1978). "On the fill factor of solar cells". Solid State Electronics. 21 (3): 519–520. doi:10.1016/0038-1101(78)90021-7. ISSN 0038-1101. ^ Keith Emery and Carl Osterwald (1987). "Measurement of photovoltaic device current as a function of voltage, temperature, intensity and spectrum". Solar Cells. 21: 313–327. doi:10.1016/0379-6787(87)90130-X. ISSN 0927-0248. ^ Yupeng Xing; et.al. (2015). "A review of concentrator silicon solar cells". Renewable and Sustainable Energy Reviews. 51: 1697–1708. doi:10.1016/j.rser.2015.07.035. ISSN 1364-0321. ^ a b "Data Sheet-Spectrolab C3P5 39.5% Solar Cell" (PDF). Retrieved 19 January 2019. ^ a b "Data Sheet-Spectrolab C4MJ 40% Solar Cell" (PDF). Retrieved 19 January 2019. ^ a b S. Kurtz. "Opportunities and Challenges for Development of a Mature Concentrating Photovoltaic Power Industry" (PDF). www.nrel.gov. p. 5 (PDF: p. 8). Retrieved 2019-01-13. ^ N.V.Yastrebova (2007). High-efficiency multi-junction solar cells: current status and future potential (PDF). ^ Andrews, Rob W.; Pollard, Andrew; Pearce, Joshua M. (2013). "Photovoltaic system performance enhancement with non-tracking planar concentrators: Experimental results and BDRF based modelling". 2013 IEEE 39th Photovoltaic Specialists Conference (PVSC). pp. 0229–0234. doi:10.1109/PVSC.2013.6744136. ISBN 978-1-4799-3299-3. ^ "IEC 61215: What it is and isn't" (PDF). ^ a b "CPV Trackers: A Crucial Aspect of Project Success?". 3 September 2012. Retrieved 5 February 2019. ^ a b "ESTCP Cost and Performance Report" (PDF). March 2018. Retrieved 5 February 2012. ^ "Photovoltaic concentrators (CPV) - Performance testing - Part 1: Standard conditions". www.iec.ch. Retrieved 2019-01-20. ^ "Parques Solares Navarra". Retrieved 25 January 2019. ^ "Guascor Foton's Navarra and Murcia CPV Power Plants". Retrieved 25 January 2019. ^ "Invenergy Announces Start of Operation Of Desert Green Solar Farm in California". Solar Power World. 8 December 2014. ^ "Fort Churchill Solar Project - Fact Sheet" (PDF). greentechmedia.com. Retrieved March 15, 2019. ^ Eric Wesoff (September 14, 2012). 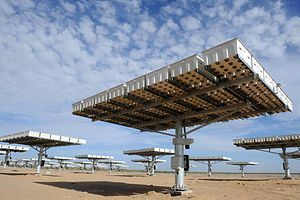 "SunPower's C7 Tracker System in 6 MW Solar Farm at Tucson Electric Power". greentechmedia.com. Retrieved March 15, 2019. 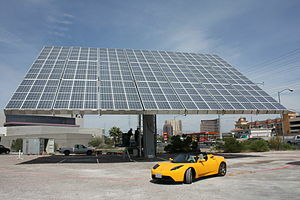 ^ "SRP and SunPower Dedicate Completed C7 Tracker Solar Power System at ASU Polytechnic Campus". SunPower. April 5, 2013. Retrieved March 15, 2019. ^ "ADAM (Advanced Dense Array Module)". ^ "Cogenra, acquired by Sunpower 2016". ^ "Gianluca Ambrosetti 2014 TED Talk". ^ "Zenith Solar Projects - Yavne". zenithsolar.com. 2011. Retrieved May 14, 2011.